Image Courtesy of James T. Dunn of 3RDSON*VIDEO PRODUCTIONS. 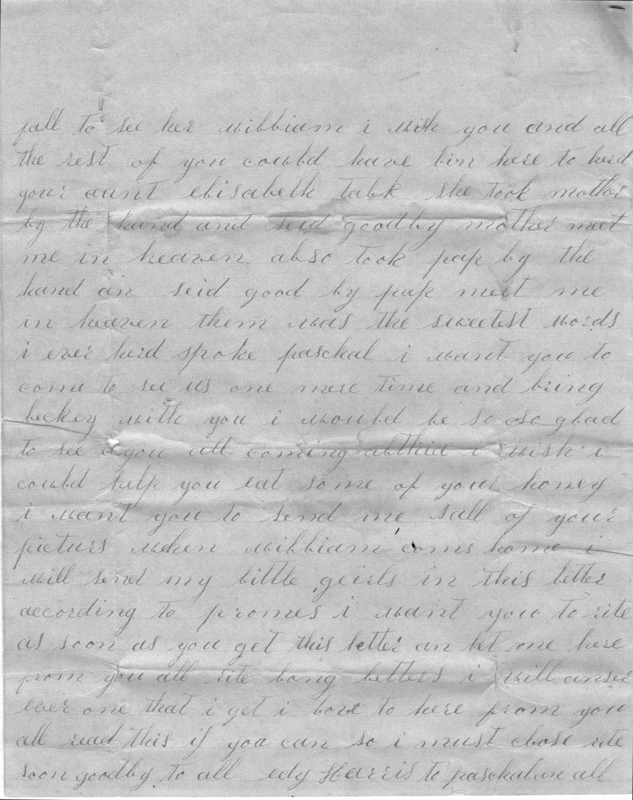 This letter is from my 3rd Great Aunt Edith West Harris in Forsyth County, Georgia to her brother, Paschal P. West in Yell County, Arkansas. Elizabeth West, mentioned in the letter, was their younger sister. I have to admit that this is the West Family letter that did me in. Without further introduction I’ll just get on with it. ( I’ve kept the original spelling, but added punctuation and paragraph breaks.) Warning: have tissues ready. I once more embrace the opportunity of dropping you afew lines to let you no that we are all tolerably well. I am not well myself. Truly hoping these lines will reach you due time and find you all well. Well Paschal I have no good news to rite. It is sad news must reach your ears in this letter. I am sorry to say to you all that Elisabeth has parted from us in death. This is sad news to rite to you all. She died last Sunday morning, about 10 o’clock. She died here at Pap’s. She died with consumption. She had been feeble and cofing for along time and after she married she got wors and wors til she was oblige to give up. She had three good doctors to wait upon her but none of them could do her any good. She suffered dreadful before she died. She died in her rite mind. She was happy for over a week before she died. She pointed out the road she was going to and all. I wish you could have all been here her talk about her sweet home she saw in heaven. She said she saw so many pretty things up there. She saw a little baby on the foot of her bed. She saw it there all night. She told mother it was her baby and come after her and was waiting for her to go. She would take spells a shouting and would talk about her sweet home as long as she could talk. She loved to talk about things above. She was so willing to die we ought not to grieve after her, but nature binds us so close we can’t help it. She told us not to grieve after her for she was going home to rest. She bade us all farewell and told us all to meet her in heaven. What a blessed thing it is to have ding(?) grace when she saw Maryan on her bed. Mother asked her if she saw Lightner two. She said no she did not see him but she said he was up there she would soon see him two. Her last days was here happiest days here on earth. She died so easy. She closed her own eyes and folded her hands across her chest and fell asleep in Jesus. Paschal, all that we can do is to try and prepare to meet her in heaven. That was her dying request. It was hard to give her up, but she is gone the way we all have to go. We received your last letter but still kept waiting thought Lisa would get better. Becky, I saw your pa an Gosy last Monday at the buriing (burying). They are all well. Your pa looks very well. We are having plenty of rain here this summer. Crops is looking well so far. Pap has not had his wheat threshed yet. I can’t tell how much he will make. His wheat is very good. William, I want to say a word or two to you. I am sorry you caused your mother to see so much trouble, but I hope you will come back this fall to see her. William, I wish you and all the rest of you could have been here to see your Aunt Elisabeth talk. She took mother by the hand and said “Goodby, Mother. Meet me in heaven.” Also took Pap by the hand and said “Good by Pap. Meet me in heaven.” Them was the sweetest words I ever heard spoke. Paschal, I want you to come to see us one more time and bring Becky with you. I would be so, so glad to see you all coming. Althie, I wish I could help you eat some of your honey. I want you to send me all of your pictures when William comes home. I will send my little girls’ in this letter according to promises. I want you to rite as soon as you get this letter and let me here from you all. Rite long letters. I will anser ever one that I get. I love to here from you all. Read this if you can. So I must close. Rite soon. Goodby to all. I’ll wait for you to stop crying and for these letters to unblur themselves. So this letter is basically one sister’s way of processing her grief over her sister’s passing. You can tell that she is reliving the events of last Sunday in her mind as she gives details in short, clipped sentences and sometimes circles back to think – and write – again on what has transpired. I can only image what a horrible week Elizabeth suffered through and how difficult and also oddly comforting for her family as she spoke of heaven, of seeing the baby Maryanne, who had died in 1863 at just 3 years old, and of knowing that their oldest son, Lightner (my 3rd Great-Grandfather) was in heaven waiting for her, too. A lot of evidence – the fact that Edith always wanted to live at home, even while married, the fact that a married Elizabeth came home to her parents’ house to die (if she ever left at all), and even the fact that Elizabeth hallucinated her little sister Maryann – demonstrates that this was a very close and loving family. I am sorry to say to you all that Elisabeth has parted from us in death. This is sad news to rite to you all. She died last Sunday morning, about 10 o’clock. According to census records, Elizabeth West was born about 1855 and this letter shows that she died on Sunday, June 26, 1882. I was never sure if the Elizabeth West mentioned in Forsyth County Marriage Records was our Elizabeth, but since Edith mentions that Elizabeth’s illness worsened after she married, I think Elizabeth must be the Elizabeth West shown in the Forsyth County, Georgia Marriage Books as marrying William O. Humphrey on Dec 18, 1881. I’m not sure what became of him after this. She had three good doctors to wait upon her but none of them could do her any good. She was so willing to die we ought not to grieve after her, but nature binds us so close we can’t help it. Mother asked her if she saw Lightner two. Lightner West was Edith’s and Paschal’s oldest brother and my 3rd Great-Grandfather. He died in the Civil War at Tazewell, TN in 1863. I’m so glad he was mentioned in this letter, because I’ve never found very much about him at all. Becky, I saw your pa an Gosy last Monday at the buriing (burying). This was Rebecca Westray West’s father and sister, Josie. William, I want to say a word or two to you. I am sorry you caused your mother to see so much trouble, but I hope you will come back this fall to see her. I really, really want to know what William did to make his mother suffer! From later writing, we know that William is Edith and Elizabeth’s nephew. I think she must be referring to William McClure (b. 1862), the son of Sarah Jane West McClure and her husband Andrew H. McClure, Paschal and Edith’s oldest sister. 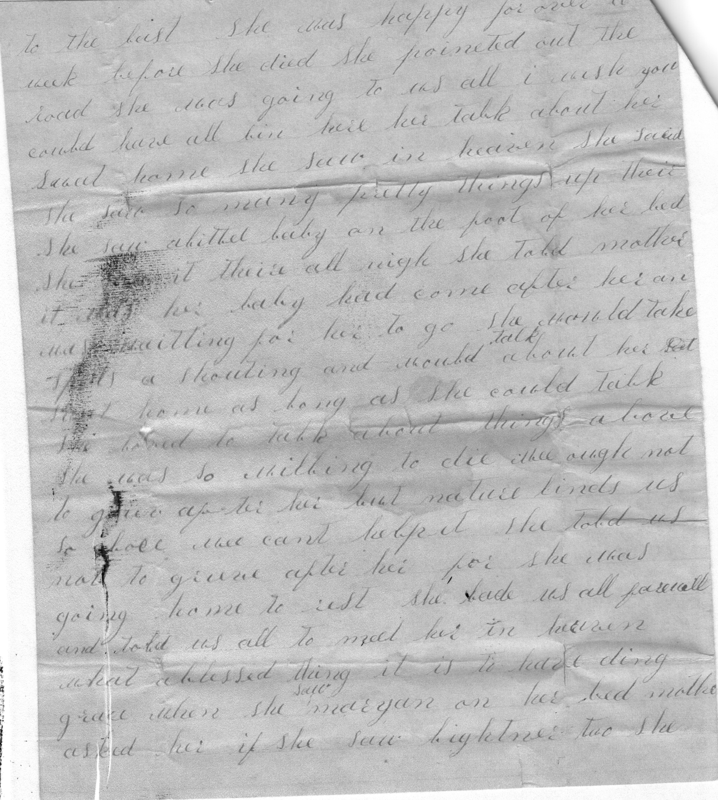 I know that the McClure family was in Arkansas along with Paschal and Rebecca by 1900, but they may have still been in Georgia in 1882, when this letter was written and when William was 20. If so, it would make sense that perhaps William ran off to Arkansas and should return home to see his mother. There was a lot of “going West” back in those times. An agricultural census shows that a Sarah Jane West owned land in Forsyth County, Georgia in 1890 even though William W. West (her brother?) is listed as her agent. It’s also a little strange that she’s listed as Sarah Jane West rather than Sarah Jan McClure, but since they lived on the “West land” it may make sense that the census taker may have just slapped the West surname on everyone. This is an interesting mystery and I hope to get to the bottom of it. Also, if this is the same William I’m thinking of, he went on to become a doctor in Arkansas so I guess his mama probably forgave him. Althie, I wish I could help you eat some of your honey. I imagine Althie is Althea West (b. 1865), daughter of Paschal West and Rebecca Westray West. I guess she kept bees? There’s also an Althie McClure in the family, but she was only about 2 years old in 1882 and I suspect they still lived in Georgia at that time anyway. This is such a wonderful find, I’m — once again — extremely grateful to my cousin Ron West and his aunt Jessie West Newman for finding and preserving these letters. I only have a copied version of this letter and page 2 is pretty wonky, but this is the best I could do. Good luck deciphering! I hope you’ve enjoyed reading this letter as much as I have (and cried a lot less than I did.) If you’re a relative or just want to say hi, leave a comment or Contact Me. Until next time, stay tuned and happy detecting! 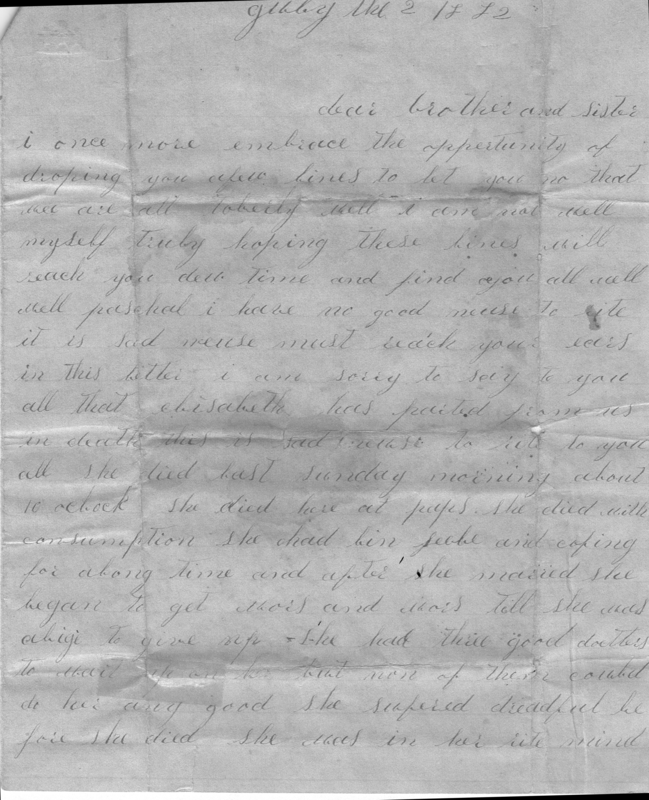 Thank you so much for transcribing the letter written by Edith West Harris. my second great grandmother. I have stared at her photo many times. He eyes always spoke to me. Reading her words was a treat. I have another one by her, too, Deb. I’ll transcribe that one more quickly now that I’m not hustling at my day job so much. Make sure you meet Lisa, the other commenter on this post! Y’all are apparently much closer related than I am to either of you. New cousins! Holy moly!!! This is the best day of my genealogy life!! Not kidding. 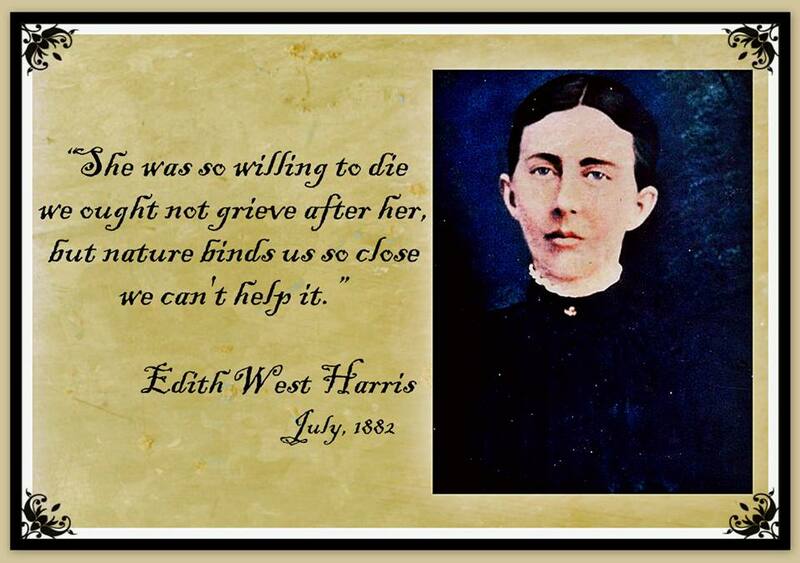 I have thought about Edith West Harris, also my 2nd great grandmother, for years and wondered about the sad events of her life and how she lived after she was abandoned by ZT Harris. I have never found proof of their marriage or evidence that they lived together. But my grandfather told me the he left with a load of cotton and a mule, told everyone that he was going to sell the cotton and never returned. Also, the fact that she named her own children after her siblings MaryAnn and Monroe (my ggrandfather and grandfather’s namesake). The day I saw MaryAnn’s grave I cried. And finally the fact that she and Monroe died so close together. It was an amazing coincidence that I ran across your email and blog today. And now I get to see my GGGrandmother’s handwriting, read her words and see her face for the first time!!! I heard the “left with a load of cotton” story from Deb, too. It’s a mystery! I have one more letter written by Edith (it isn’t as dramatic as this one, sadly.) I’ll transcribe it ASAP! 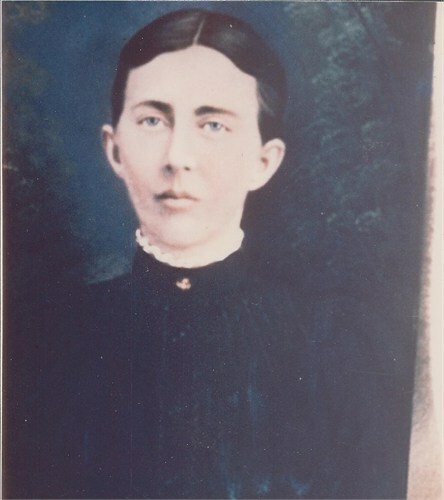 Mary Ann Harris Pruitt is my great grandmother. Her daughter, Sarah Pruitt Corn,is my grandmother, and Hazel Corn Wakefield is my mother. Lisa and I are pretty closely related. I had heard the same family story about Zachariah Harris. My mother said he left and was never heard from again. I searched Ancestry.com and the internet until I ran across a record that said he died in Kansas. After searching every cemetery record in the county, I found his burial info. Several months later, one of his great grand daughters by his second wife contacted me with a lot of info on his later life. Deborah, please email me at lisa.l.harris@live.com I’d like to share info and send you a photo. I am glad these letters have been helpful. There was a stack of letters belonging to Paschal and Rebecca West that I only recently discovered. They were at the home of my father’s cousin, Jesse West Newman. She and my father are grandchildren of Paschal West. Jesse was very interested in the genealogy of the West family but did not have the internet capabilities we have today. When she passed away in the early 1990s they went to my mother who placed them in a drawer that I discovered a few years ago and started my interest in the West family genealogy. Growing up I knew my grandparent’s names and had heard the name Paschal West but knew nothing of the West family beyond that. I have several other letters from Rebecca’s sister Josie and her father Samuel Westray of Forsyth County. I don’t remember any information especially interesting or much mention of the West side of the family. I will look through them again and see if I can find any thing helpful. I am part of the Wests that went West to Arkansas around 1870. There are not many of us left here now. I have heard of the Wests descended from George West who came to Yell County also but for some reason we have lost touch with each other. Ron, Just yesterday, I took my daughter to the graveyard at Salem church in Dawson Co. where Rebecca West’s father Samuel Westray’s grave is located. She was so enthused with the Westray linage and my stories that we are researching the Westray history. Samuel is my 3rd great grandfather followed by Barto and John. Edna Mary Jane Westray-Jennings was my grandmother and she told me many stories of her aunt Josie. 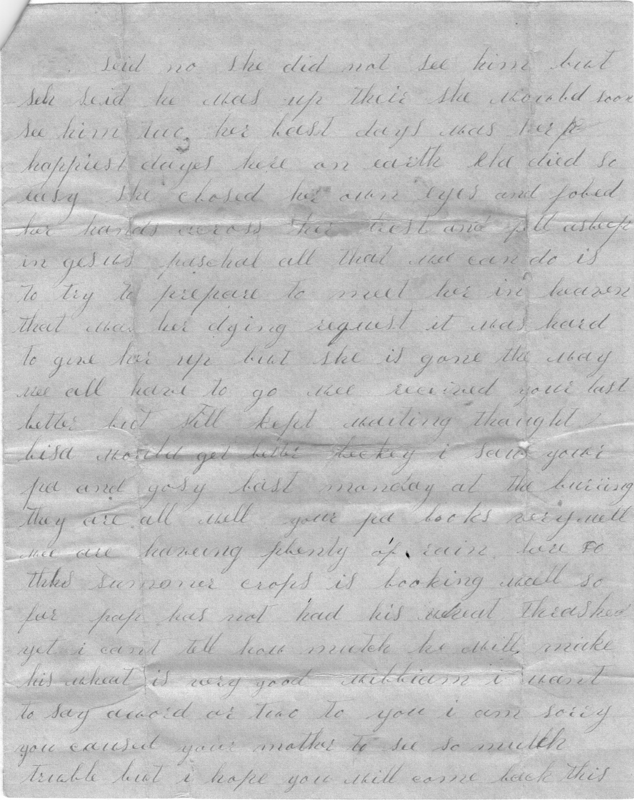 I read of the stack of letters you found from Samuel and Josie Westray-Hayes and I would love to somehow to be able to read copies of these letters and to share them with my Westray family at our fall reunion. Thank you for the work you have put into this site. Joey, I am outside the US traveling right now but when I return in a week I would be happy to make copies and send them to you if I could get an address. I have several by Samuel and Josie. My Dad’s cousin Jessie who provided these letters to me attended a Westray reunion back in the 80s in Georgia. I was very thankful to find all this information about my 2nd great-grand-mother, I’ve been running genealogy on the Pruitt and Harris side of my family and all this really pops of history. Ancestry.com is a great tool for tracing family history. My mother was a Pruitt, Mary Ann Harris is my great grand-grandmother, who married Fredrick Pruitt. Thanks again for preserving history, I’ll make sure to let my children and grand children know the history, and hopefully they’ll pass it down for year to come. Thanks for commenting, Ronnie. It’s so great to meet another cousin! There are a couple more letter and I hope to transcribe and publish them very soon! 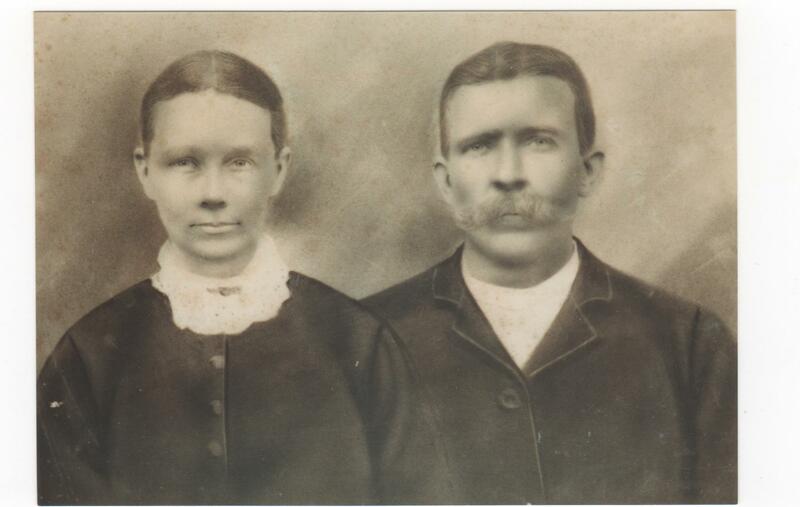 Fred Pruitt and Mary Ann Harris are also my great grandparents. My grandmother is Sarah Pruitt Corn, their daughter. The same goes for all our our Harris/West/Pruitt kin, I’d love to hear from you. Well hi cousin Lisa, looks like your great-grandfather and my great-grandmother were brother and sister. Yes I’m on Ancestry.com. Haven’t seen the photo yet, I’ll try to find your tree on Ancestry, I’ll send you an email at the above address and perhaps we can discuss family.